Dendritic cells are powerful antigen-presenting cells that can generate primary cytolytic T lymphocyte responses against tumors. Consequently, there has been much interest in their application as antitumor vaccines. A number of dendritic cell-based vaccine trials targeting a variety of tumors have been conducted in different countries; however, the rate of clinical responses remains low. The majority of these studies have administered dendritic cells loaded with synthetic peptide epitopes or tumor lysates. 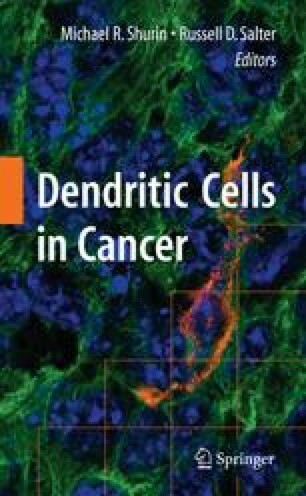 Genetic modification of dendritic cells to express tumor antigens or immunostimulatory molecules through gene transfer or mRNA transfection offers a logical alternative with potential advantages over antigen loading in dendritic cells. In this chapter, we review the current and future prospects for genetically modified dendritic cell vaccines for cancer therapy. This project has been funded in whole or in part with federal funds from the National Cancer Institute, National Institutes of Health, under contract no. N01-CO-12400. The content of this publication does not necessarily reflect the views or policies of the Department of Health and Human Services, nor does mention of trade names, commercial products or organizations imply endorsement by the US Government.